I seem to have a bit of a backlog of cards needed right now! I'm still getting caught up on Thank You cards for baby Erica and then there are a bunch of family birthdays as well as Mothers' Day around the corner. 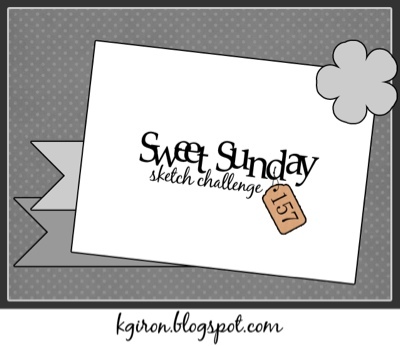 I found a great sketch over at Stampin' Queen's Sketch Challenge. As well, Heart 2 Heart and There She Goes have a challenge this week to use flowers on a project. 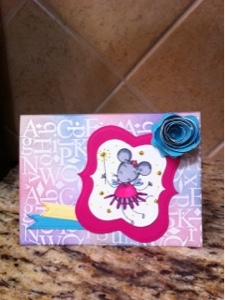 And lastly, Scrapbookers Paradise's challenge is a card for a friend. 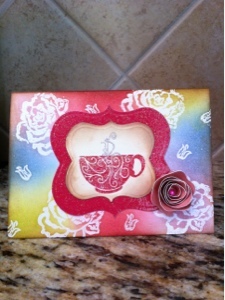 For my cards I clear embossed a card background with a CTMH floral stamp as a resist and sponged on distress ink. 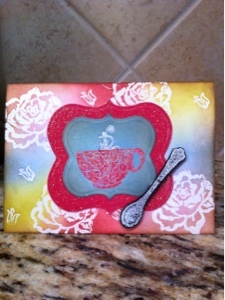 I then layered Spellbinders die cuts in the center and embossed a CTMH tea cup stamp (love this cute stamp!). I added a few stickles to the steam and on one card embossed a silver spoon CTMH stamp on black cardstock and on the other added a flower cut at 3" from the CTMH Art Philosophy Cricut cartridge. What friend wouldn't want to receive this?!! Thanks for joining me. Hope the April showers are almost over and looking forward to May flowers! It is my beautiful niece, Sydney's birthday on Thursday and she's turning 12! I can't believe it! She is so sweet and creative and always makes us the most amazing cards. For her card this year I used a digital stamp from Heather Ellis' Etsy store, which I colored with Prismacolor markets and cut out with a spellbinders die. For the card background I stamped a background and used clear embossing powder as a resist and then used distress ink to coordinate with the colors in the stamped image. Finally the flower is made with the CTMH Art Philosophy cart and cut at 4". I added some Stickles and a pearl to the center of the flower. I finally got to use my Art Philosophy cartridge from Close To My Heart! It is such an awesome cartridge! There are so many cuts to choose from... 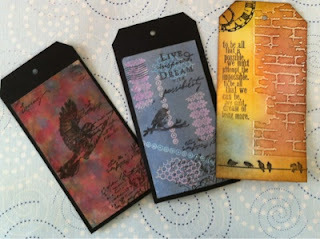 I made these 3 cards from one of the card cuts on the cartridge. It was so easy to fold perfectly with the score lines, and I used my Scor Pal to completely score down the fold. I used a digital My Favorite Things, Pure Innocence stamp from Heather Ellis' Etsy shop, which I colored with Prismacolor markers. 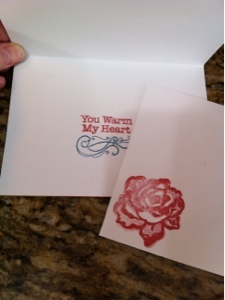 I added Stickles to the card and around the flower cutout, and put a coordinating paper inside the card. Well, I finally finished the techniques from Day 2 and am very pleased with the results. 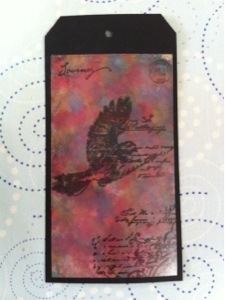 I didn't do everything exactly the same as Tim Holtz, but that's the fun of it - finding out the basics behind the products and then experimenting! 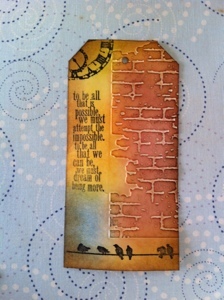 The 3 tags today are Alcohol Ink background, archival resist, and texture fade with distress inks. The last would have to be my favorite. I love the brick folder. 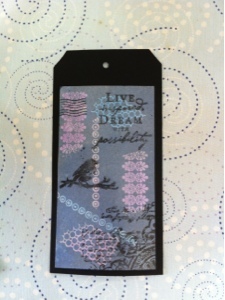 It comes with the wood grain embossing folder from Sizzix.